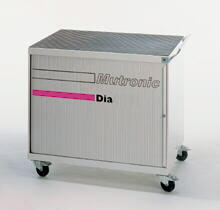 Tool cabinet made of solid steel with four pivoting rollers, specially designed for DIADISC cut-off saws. The cabinet can hold optional equipment such as the spray mist atomizer and the DIAVAC extraction unit, thanks to its high load-bearing capacity. An integrated steel drawer with suitable holders is provided for saw blades and chucks.